Transcribed and edited by Timothy J. Dennee, 2007, all rights reserved. Freedpeople at Richmond, 1865. Library of Congress. Near the end of 1865, all Freedmen's Bureau district offices were ordered to take a census of the African American population in their jurisdictions. Most of these censuses have been lost, although the raw numbers generally remain. Until recently, it was thought that the Alexandria County, Virginia census was also lost. But a fragment-containing surnames starting with the letters Q through Y, plus some "B"s-turned up at the Library of Virginia. In fact, it appears, unidentified, at the end of a reel of microfilm containing a ledger of courts-martial for the Military District of Alexandria, 1864-1865 (Arlington County records, reel #2014). I would like to thank Sarah Nerney and Callie Freed of the Library of Virginia for going back to the original document and locating the entries for the "Q" surnames, which were not originally microfilmed. While this census does not contain exact ages or addresses, it is something of a Holy Grail for local research of African Americans in the Civil War/Reconstruction era. It provides a snapshot of a greatly expanded and fluid population and, if complete, would comprise the most thorough documentation of African American inhabitants of the period. Even as found, it is one of the most important pre-1870 records of Alexandria's freedpeople, as it contains information about women and children, people often anonymous in tax records and city directories. As transcribed, the document has been altered in minor ways, but the overall format, name order and spellings have been retained. The "B" names are labeled in the original record as "Miscellaneous Names" and appeared at the very end. The headings have been changed somewhat, e.g., "Occupation" to "Job" for space reasons. "Status" has been more fully explained as "Pre-War or Pre-1863 Status" relating to residence in the county before the war and whether each individual had recently been a slave. "Free" people were presumably legally free before the January 1, 1863 Emancipation Proclamation. N.B. : Until that time most of Alexandria's freedpeople were still legally slaves, i.e., property seized as "contraband of war." Therefore, children born after the war broke out but before emancipation could still technically be slaves, even if they had never seen by their masters, but it is not clear whether all respondents would have characterized them as such. This may partly explain the high proportion of "free," as would the large representation of long-time Alexandria residents; the city of Alexandria had had a substantial free-black population by the early nineteenth century. Groupings of surnames commonly signify family relationships. Many of the spellings are clearly mistaken and often phonetic. The census was taken by soldiers detailed from the 195th Ohio Infantry regiment, and the returns from each district were copied into the single final count. The misspellings are indicative of the level of literacy of both the enumerators and the enumerated, plus copying errors by a clerk. In fact, even the first letters of some surnames have probably been set down incorrectly (e.g., "Right" clearly should be "Wright," "Umphrey" and "Umphreys" should be Humphrey and Humphreys, and "Semis" might be Lewis). Finding names may require some patience; the researcher may use the "find" function on his or her browser but should be prepared to scroll through the data with all possible spelling variants in mind. To assist, a list of possible variants to some of the surnames contained in each table follows at the end of each table, so that the browser might "pick up" those names. To go directly to names, go to the letter links at the bottom of this page. This geographic information will be most useful when cross-referenced with property and capitation tax records (and other sources) from 1865-1866 (see elsewhere on the website). These persons live in the upper part of Alexandria County nearly all within four miles of the Freedmans Village. The detail engaged in taking the census were relieved before quite completing it, but made an estimate as accurately as possible and reported 250 names not taken. They have been classified by me in proportion [to] the summary of the census and added as above. These Returns embrace all of Alexandria Co, Va, Freedmens Village excepted. (sig) Henry E. Alvord, Superintendent. 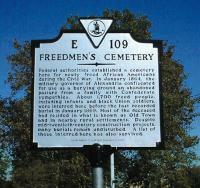 The sum of all the Alexandria City and Alexandria County population, including the 980 residents of Freedmen's Village, was 8,743 persons in December 1865. It appears that the freed population had finally peaked and stabilized (although not representing the true "turnover" of migration) at that time, a good thing given what the data indicates about the high unemployment level and the remarkably small number receiving direct government assistance (likely rations and possibly free or subsidized housing). 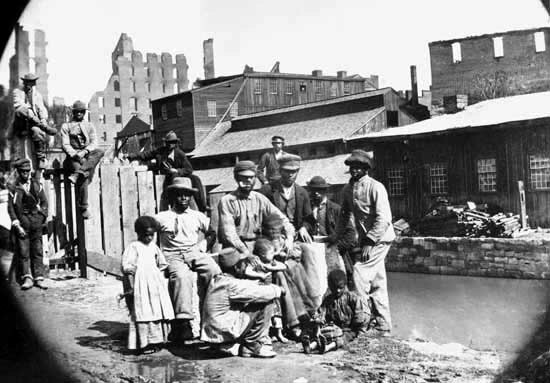 A year later, the population of city and county-presumably exclusive of Freedmen's Village-was put at 7,677, with 3,432 males, 4,245 females, or a total of 7,677 people, with 4,680 individuals over fourteen years of age and 2,997 fourteen and under. The county portion consisted of 2,399 total, with 1,390 individuals over the age of fourteen, and 1,140 total males, 1259 females. (Record Group 105, Entry 3878, Miscellaneous Records, letter from Captain S.P. Lee to Brevet Lieutenant Colonel W.W. Rogers, December 4, 1866 and letter from Lieutenant P.R. Hambrich to S.P. Lee, November 28, 1866). The 1865 census name lists by initial letter of surname can be accessed by the respective links below. Again, the "B" and "R" name lists are fragmentary, although most of the Rs are present. The "B" list is a collection of "miscellaneous" names from the seventh and eighth districts. Above documents have been provided in the printer friendly PDF format. In order to view the documents you must have Adobe Acrobat Reader installed on your machine. If you do not have Adobe Acrobat Reader, please click on the Adobe icon to download.